It is time for the annual card drive over at Winter Wonderland! Each year this Blogger organizes an awesome Valentine's Day card drive for children. To learn more about this please head on over here. I can't think of a better recipient for a Valentine card than a child. 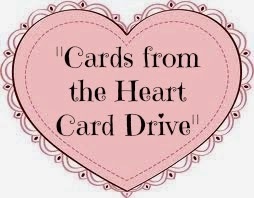 I hope you will share your craftiness and send a few cards to the "Cards From The Heart Drive". Thanks for stopping by and have a magical day! !